Crowd Company rose from the ranks of London’s burgeoning funk/soul scene to assert themselves as an act to watch out for, with engaging live performances and a finely tuned sound based on retro grooves with a soulful edge and a modern twist. After playing in venues such as The 100 Club and Band On The Wall, and sharing stages with artists such as George Porter Jr of The Meters, this 8 piece is now ready to reveal itself to the world with its debut full-length release, “Now Or Never” which sees the participation of Joe Tatton from The New Mastersounds and Alan Evans from Soulive. From fast-paced, modern soul opener “Are You Feeling It” to mid-tempo burner “Turn It Loose feat. Alan Evans”, from the latin-tinged rhythms of “It’ll Work Out Fine” to the cosmic jazz-funk of “Electrify feat. Alan Evans”, new album “Now Or Never” packs a solid punch when it comes to the grooves it provides. Get hooked to the hard-hitting drums of the titletrack‘s feel-good funk, or to the infectious vibes of stand-out number “All I Can Do feat Joe Tatton & Alan Evans”, a hypnotic slab of early 70s psych-funk with a contemporary edge. To best capture the band’s bristling live energy the album was recorded entirely to tape at Cowshed Studio, London, and later mixed by Alan Evans and mastered by Paul Gold at Salt Mastering in Brooklyn. With groovin Hammond organ, virtuoso horn section, tight beats and soulful vocals this release sees Crowd Company provide a unique blend of catchy modern funk & soul tunes and jazzy inflections. 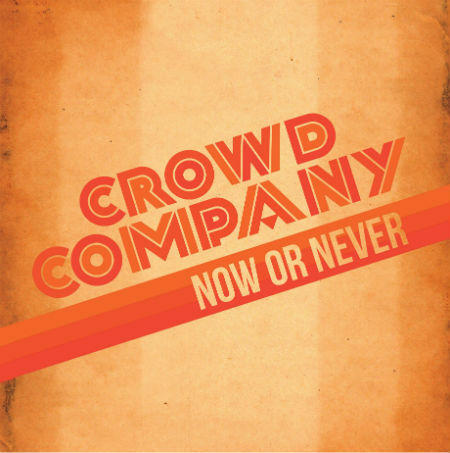 Time to get down to Crowd Company, it’s “Now Or Never”!